A dry dock (sometimes dry-dock or drydock) is a narrow basin or vessel that can be flooded to allow a load to be floated in, then drained to allow that load to come to rest on a dry platform. Dry docks are used for the construction, maintenance, and repair of ships, boats, and other watercraft. The Saint-Nazaire's Chantiers de l'Atlantique owns one of the biggest in the world: 1,200 by 60 metres (3,940 ft × 200 ft). The largest graving dock of the Mediterranean as of 2009 is at the Hellenic Shipyards S.A. (HSY S.A., Athens, Greece). The Alfredo da Silva Dry Dock in Almada, Portugal, was closed in 2000. The largest roofed dry dock is at the German Meyer Werft Shipyard in Papenburg, Germany, it is 504 m long, 125 m wide and stands 75 m tall. Harland and Wolff Heavy Industries in Belfast, Northern Ireland, is the site of a large dry dock 556 by 93 metres (1,824 ft × 305 ft). The massive cranes are named after the Biblical figures Samson and Goliath. Dry Dock 12 at Newport News Shipbuilding at 662 by 76 metres (2,172 ft × 249 ft) is the largest dry dock in the USA. The largest floating-dock in North America is named The Vigorous. It is operated by Vigor Industries in Portland, OR, in the Swan Island industrial area along the Willamette River. 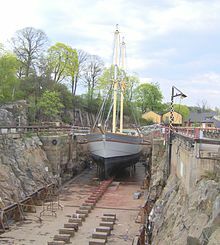 A graving dock is the traditional form of dry dock. It is narrow basin, usually made of earthen berms and concrete, and closed by gates or by a caisson. When open, a vessel is floated in and the water pumped out, leaving the craft supported on blocks. The keel blocks as well as the bilge block are placed on the floor of the dock in accordance with the "docking plan" of the ship. Routine use of dry docks is for the "graving" i.e. the cleaning, removal of barnacles and rust, and re-painting of ships' hulls. Some fine-tuning of the ship's position can be done by divers while there is still some water left to manoeuvre it about. It is extremely important that supporting blocks conform to the structural members so that the ship is not damaged when its weight is supported by the blocks. Some anti-submarine warfare warships have protruding sonar domes, requiring that the hull of the ship be supported several metres from the bottom of the drydock. Once the remainder of the water is pumped out, the ship can be freely inspected or serviced. When work on the ship is finished, water is allowed to re-enter the dry dock and the ship is carefully refloated. Modern graving docks are box-shaped, to accommodate the newer, boxier ship designs, whereas old dry docks are often shaped like the ships that are planned to be docked there. This shaping was advantageous because such a dock was easier to build, it was easier to side-support the ships, and less water had to be pumped away. Dry docks used for building Navy vessels may occasionally be built with a roof. This is done to prevent spy satellites from taking pictures of the dry dock and any ships or submarines that may be in it. During World War II, fortified dry docks were used by the Germans to protect their submarines from Allied air raids (see submarine pen). Today, covered dry docks are usually used only when servicing or repairing a fleet ballistic missile submarine. Another advantage of covered dry docks is that work can take place independently of the weather; this is frequently used by modern shipyards for construction especially of complex, high-value vessels like cruise ships where delays would incur a high cost. A floating dry dock is a type of pontoon for dry docking ships, possessing floodable buoyancy chambers and a "U"-shaped cross-section. The walls are used to give the dry dock stability when the floor or deck is below the surface of the water. When valves are opened, the chambers fill with water, causing the dry dock to float lower in the water. The deck becomes submerged and this allows a ship to be moved into position inside. When the water is pumped out of the chambers, the dry dock rises and the ship is lifted out of the water on the rising deck, allowing work to proceed on the ship's hull. 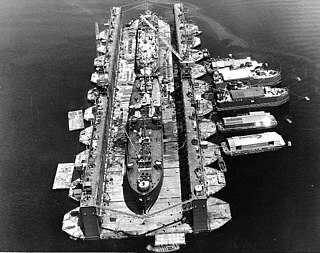 A large floating dry dock involves multiple rectangular sections. These sections can be combined to handle ships of various lengths, and the sections themselves can come in different dimensions. Each section contains its own equipment for emptying the ballast and to provide the required services, and the addition of a bow section can facilitate the towing of the dry dock once assembled. For smaller boats, one-piece floating dry docks can be constructed, potentially coming with their own bow and steering mechanism. Shipyards operate floating dry docks as one method for hauling or docking vessels. Floating drydocks are important in locations where porous ground prevents the use of conventional drydocks, such as at the Royal Naval Dockyard on the limestone archipelago of Bermuda. Another advantage of floating dry docks is that they can be moved to wherever they are needed and can also be sold second-hand. During World War II, the U.S. Navy used such Auxiliary floating drydock extensively to provide maintenance in remote locations. 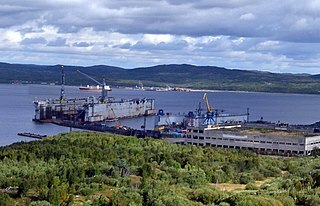 Two of these are the 1,000 feet AFDB-1 and the 850-foot AFDB-3, an Advance Base Sectional Dock, which saw action in Guam, was mothballed near Norfolk, Virginia, and was eventually towed to Portland, Maine, to become part of Bath Iron Works' repair facilities. A downside of floating dry docks is that unscheduled sinkings and off-design dives may take place. The "Hughes Mining Barge", or HMB-1, is a covered, floating drydock that is also submersible to support the secret transfer of a mechanical lifting device underneath the Glomar Explorer ship, as well as the development of the Sea Shadow stealth ship. Some dry docks are used during the construction of bridges, dams, and other large objects. For example, the dry dock on the artificial island of Neeltje-Jans was used for the construction of the Oosterscheldekering, a large dam in the Netherlands that consists of 65 concrete pillars weighing 18,000 tonnes each. The pillars were constructed in a drydock and towed to their final place on the seabed. A dry dock may also be used for the prefabrication of the elements of an immersed tube tunnel, before they are floated into position, as was done with Boston's Silver Line. St Nazaire Raid — 1942 attack on a dry dock during World War II. ^ Levathes, Louise (1994). When China Ruled the Seas. Oxford University Press. p. 77. ISBN 978-0-19-511207-8. ^ Bouée, Charles-Edouard (2010). China's Management Revolution: Spirit, Land, Energy. Palgrave Macmillan. p. 84. ISBN 978-0230285453. ^ Sarton 1946, p. 153. ^ Sarton 1946, pp. 153f. ^ "Meyer Werft baut größte Dockhalle der Welt". Spiegelonline. 2008-01-18. Retrieved 2009-06-25. ^ "North America's largest drydock floats first ship at Swan Island's Vigor Industrial (infographic and time lapse)". OregonLive.com. Retrieved 2016-11-03. ^ Noel, John V. (1988). Knight's Modern Seamanship (18 ed.). John Wiley and Sons. pp. 81–82. ISBN 0-471-28948-5. ^ SEAN GALLAGHER (20 October 2018). "Russia's only aircraft carrier damaged as its floating dry dock sinks". Ars Technica. Retrieved 5 November 2018. Due to interruptions in the supply of electric power to the PD-50, the floating dock dived out in an off-design mode. Wikimedia Commons has media related to Dry docks. "Docks's Life". All about floating docks of shipbuilding firm "Almaz". St.-Petersburg. Russia. A dock is the area of water between or next to one or a group of human-made structures that are involved in the handling of boats or ships or such structures themselves. The exact meaning varies among different variants of the English language. ABSD-7, an advanced base sectional dock, was constructed of seven advance base docks (ABD) as follows: ABD-37, ABD-38, ABD-39, and ABD-40 were built by Chicago Bridge & Iron Company, Morgan City, Louisiana, and completed in December 1944 and January and February 1945; ABD-51 and ABD-52 were built by Pollock-Stockton Shipbuilding Company, Stockton, California, and completed in January and March 1945; and ABD-58 was built by Pittsburgh-Des Moines Steel Co., Pittsburgh, Pennsylvania, and completed in October 1944. The Hughes Mining Barge, or HMB-1, is a submersible barge about 99 m (324 ft) long, 32 m (106 ft) wide, and more than 27 m (90 ft) tall. The HMB-1 was originally developed as part of Project Azorian, the top-secret effort mounted by the Central Intelligence Agency to salvage the remains of the Soviet submarine K-129 from the ocean floor. An auxiliary ship is a naval ship designed to operate in support of combatant ships and other naval operations. Auxiliaries are not primary combatants, although they may have some limited combat capacity, usually of a self-defence nature. USS Artisan (ABSD-1), later redesignated as (AFDB-1), was a ten-section, non-self-propelled, large auxiliary floating drydock of the United States Navy. The only U.S. warship of its name, Artisan was constructed in sections during 1942 and 1943 by the Everett-Pacific Shipbuilding & Dry Dock Company, in Everett, Washington; the Chicago Bridge & Iron Company, in Eureka, California; the Pollock-Stockton Shipbuilding Company, in Stockton, California; and the Chicago Bridge & Iron Company, in Morgan City, Louisiana. This ship was commissioned at Everett, Washington, on 10 May 1943, Captain Andrew R. Mack in command. With all ten sections joined, she was 927 feet long, 28 feet tall, and with an inside clear width of 133 feet 7 inches. USS Dewey (YFD-1) was a floating dry dock built for the United States Navy in 1905, and named for American Admiral George Dewey. The Auxiliary floating drydock was towed to her station in the Philippines in 1906 and remained there until scuttled by American forces, to prevent her falling into the hands of the invading Japanese. The Seattle Construction and Drydock Company was a shipbuilding company based in Seattle, Washington. Formally established in 1911, the shipyard could trace its history back to 1882, when Robert Moran opened a marine repair shop at Yesler's Wharf. This shop became the Moran Brothers Shipyard in 1906 and the Seattle Construction and Drydock Company at the end of 1911. The plant of the Moran company, together with that of the Seattle Dry Dock & Ship Building Company, which had been organized in 1887 and was under the control of the Morans, was at this time the most complete on the Pacific Coast, outside of San Francisco. It had grown to such immense proportions that even while the construction of its masterpiece, the (USS) Nebraska, was underway, other work was being handled in the same efficient manner as before the big contract had been secured. Some of the notable work turned out during the period was the building of the steel tugs Bahada and Wyadda, the lighthouse tender Heather and the rebuilding of the steamships Cutch and Willamette. When the Nebraska was finished and given her official trial trip in the waters of the Straits of Fuca, Captain Perkins, senior member of the trial board, pronounced her one of the best vessels in the United States navy. Notwithstanding bad weather, the ship fully met the requirements of the Government and proved that Seattle had a construction company capable of building the largest kind of ship. In March, 1906, the Moran Brothers Company was sold to Eastern capitalists, who reorganized the business under the name of The Moran Company, which, in 1912, became the Seattle Construction & Dry Dock Company. During the year 1911 the company began building the first of six submarine boats for the United States navy. About the same time five steel whalers were built for companies operating in the northern whaling waters, and in 1913 the $500,000 dry dock was completed. This dry dock was 468 feet long and 110 feet wide and the steamship Admiral Farragut was the first vessel to enter it for repairs. A caisson is a form of lock gate. It consists of a large floating iron or steel box. This can be flooded to seat the caisson in the opening of the dock to close it, or pumped dry to float it and allow it to be towed clear of the dock. PD-50 was a Russian floating dry dock. It was built at the Götaverken Arendal shipyard in Gothenburg, Sweden and commissioned in 1980s. At the time, it was the world's largest floating dry dock and used primarily to service the ships and submarines of the Northern Fleet. Auxiliary floating drydock are US Navy floating dry docks that are able to submerge under water and be placed under a ship in need of repair below the water line. Floating drydocks then rise up under the ship raising the ship out of the water. The ship is now blocked on the deck of the floating dry dock for repair. Most floating drydocks had no engine and are towed by tugboats to locations. Floating dry docks come in a different sizes to accommodate varying ship sizes. The large floating drydocks come in sections and can be assembled together to increase the size and lift power. Ballast pontoons tanks are flooded with water to submerge or pumped dry to raise the ship. USS AFDM-2 (YFD-4) is an AFDM-3-class medium auxiliary floating drydock built in Mobile, Alabama by the Alabama Drydock and Shipbuilding Company for the U.S. Navy. Originally named USS YFD-4, Yard Floating Dock-4, she operated by Todd Shipyards at New Orleans, Louisiana for the repair of US ships during World War II. YFD-4 was renamed an Auxiliary Floating Dock Medium AFDM-2 in 1945 after the war. USS AFDM-2 was 37 feet (11.3 m) tall, 116 feet (35.4 m) wide, length of 614 feet (187.1 m), and has a displacement of 6,360 tons. AFDM-2 could lift capacity 9,000 tons and had two service cranes to lift material and parts for removing damage parts and the installation of new parts. The floating drydock can repair ships up to a beam of 90 feet (27.4 m), as she is 90 feet wide between the wing walls. Ballast pontoons tanks are flooded with water to submerge or pumped dry to raise the ship. Submerged she can load a ship with a draft up to 20 feet (6.1 m). USS ABSD-2, later redesignated as AFDB-2, was a ten-section, non-self-propelled, large auxiliary floating drydock of the US Navy. Advance Base Sectional Dock-2 was constructed in sections during 1942 and 1943 by the Mare Island Naval Shipyard in Vallejo, California for World War 2. Her official commissioning ceremony took place on 14 August 1943 with CDR. Joseph J. Rochefort in command. With all ten sections joined, she was 927 feet long, 28 feet tall, and with an inside clear width of 133 feet 7 inches. ABSD-2 had a traveling 15-ton capacity crane with a 85-foot radius and two or more support barges. The two side walls were folded down under tow to reduce wind resistance and lower the center of gravity. ABSD-2 had 6 capstans for pulling, each rated at 24,000 lbf (110,000 N) at 30 ft/min (0.15 m/s), 4 of the capstans were reversible. There were also 4 ballast compartments in each section. ABSD-3, is an advanced base sectional dock, was constructed of nine advance base docks (ABD)sections for the US Navy as an auxiliary floating drydock for World war 2. ABSD-3 was delivered to the US Navy on April 1944. ABSD-3 was commissioned on 27 October 1944. Advance Base Sectional Dock-3 was constructed in sections during 1942 and 1943. Each section are 3,850 tons and are 93 feet long each. Each Section had a 165 feet beam, a 75 feet molded depth and had 10,000 tons lifting capacity each. There were 4 ballast compartments in each section. With all nine nine sections joined, she was 844 feet long, 28 feet tall, and with an inside clear width of 133 feet 7 inches. ABSD-2 had a traveling 15-ton capacity crane with a 85-foot radius and two or more support barges. The two side walls were folded down under tow to reduce wind resistance and lower the center of gravity. ABSD-3 had 6 capstans for pulling, each rated at 24,000 lbf (110,000 N) at 30 ft/min (0.15 m/s), 4 of the capstans were reversible. ABSD-6, is an advanced base sectional dock, was constructed of nine advance base docks (ABD)sections for the US Navy as an auxiliary floating drydock for World war 2. ABSD-6 was built by Mare Island Naval Shipyard at Vallejo, California. ABSD-6 was commissioned on 28 September 1944. Advance Base Sectional Dock-6 was constructed in sections during 1942 and 1943. Each section are 3,850 tons and are 93 feet long each. Each Section had a 165 feet beam, a 75 feet molded depth and had 10,000 tons lifting capacity each. There were 4 ballast compartments in each section. With all nine nine sections joined, she was 825 feet long, 28 feet tall, and with an inside clear width of 133 feet 7 inches. ABSD-2 had a traveling 15-ton capacity crane with a 85-foot radius and two or more support barges. The two side walls were folded down under tow to reduce wind resistance and lower the center of gravity. ABSD-6 had 6 capstans for pulling, each rated at 24,000 lbf (110,000 N) at 30 ft/min (0.15 m/s), 4 of the capstans were reversible. USS ABSD-4, later redesignated as AFDB-4, was a nine-section, non-self-propelled, large auxiliary floating drydock of the US Navy. Advance Base Sectional Dock-4 was constructed in sections during 1942 and 1943 by the Mare Island Naval Shipyard in Vallejo, California for World War 2. With all ten sections joined, she was 927 feet long, 28 feet tall, and with an inside clear width of 133 feet 7 inches. ABSD-4 had a traveling 15-ton capacity crane with a 85-foot radius and two or more support barges. The two side walls were folded down under tow to reduce wind resistance and lower the center of gravity. ABSD-4 had 6 capstans for pulling, each rated at 24,000 lbf (110,000 N) at 30 ft/min (0.15 m/s), 4 of the capstans were reversible. There were also 4 ballast compartments in each section. USS ABSD-5, later redesignated as AFDB-5, was a nine-section, non-self-propelled, large auxiliary floating drydock of the US Navy. Advance Base Sectional Dock-5 was constructed in sections during 1943 and 1944 by the Chicago Bridge & Iron Company in Morgan City, Louisiana for World War 2. With all nine sections joined, she was 825 feet long, 28 feet tall, and with an inside clear width of 133 feet 7 inches. ABSD-5 had two traveling 15-ton capacity crane with a 85-foot radius and two or more support barges. The two side walls were folded down under tow to reduce wind resistance and lower the center of gravity. ABSD-5 had 6 capstans for pulling, each rated at 24,000 lbf (110,000 N) at 30 ft/min (0.15 m/s), 4 of the capstans were reversible. There were also 4 ballast compartments in each section. USS ARD-1 was an auxiliary repair dock serving with the United States Navy during World War II as Auxiliary floating drydock. ARD-1 was built by the Pacific Bridge Company and completed in September 1934. ARD-1 was commissioned at Alameda, California on 19 December 1935 then towed to San Diego, California. ARD-1 was the first in her class of self-sustaining, ship hull shape ship repair docks. ARD-1 was able to repair ships in a Naval fleet in remote locations. Lieutenant commander Charles M. Johnson was the first in command of ARD-1.